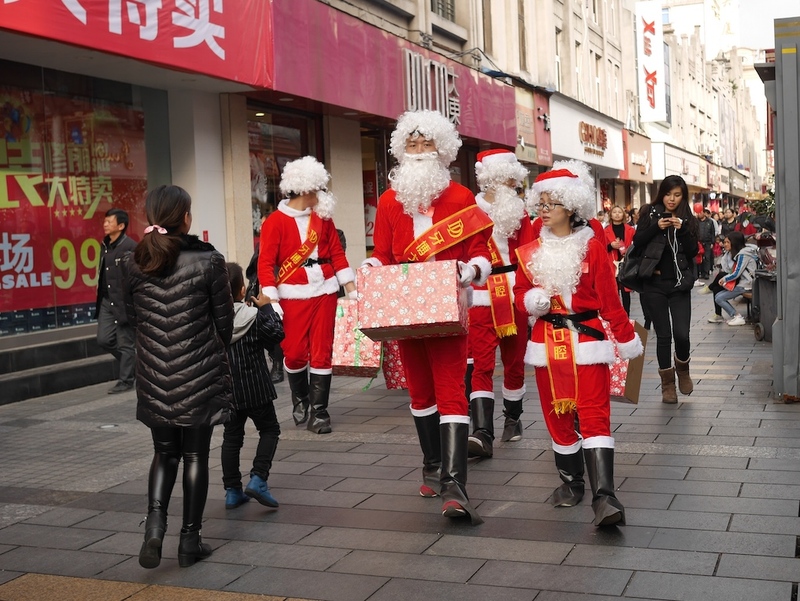 I didn't only observe many examples of the Christmas holiday in Wenzhou, China, this year. I also observed a Jewish tradition in the U.S. for December 25: I ate Chinese food. 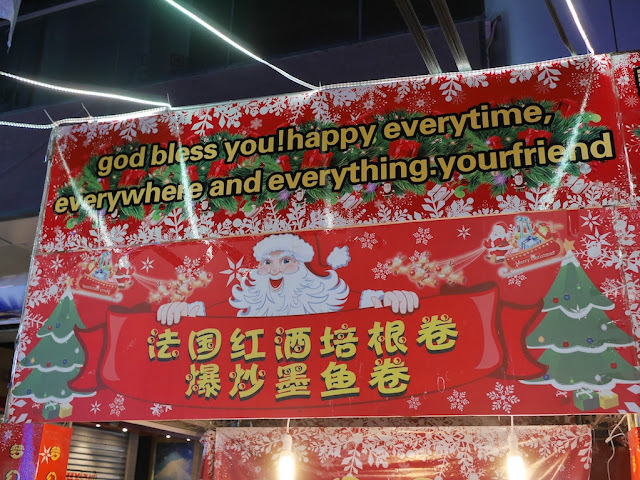 Of course, finding Chinese food isn't too much of a challenge in China, but this time the local food in Wenzhou allowed me to also feel some of the Chanukah holiday spirit — particularly fitting since this year its first full day was also December 25. 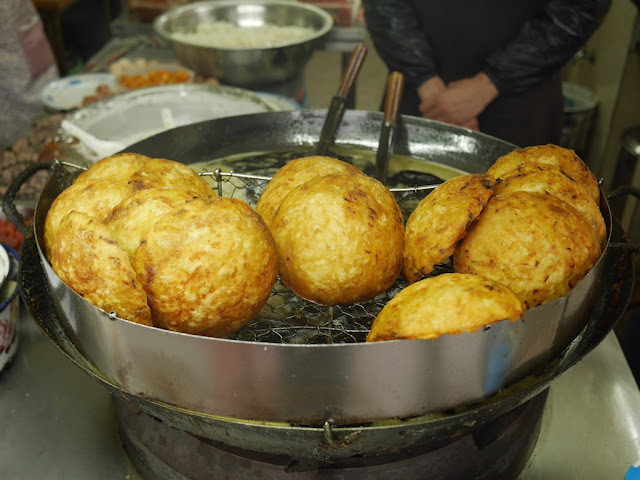 The deep fried cakes are very similar in concept and taste to the latkes (potato pancakes) commonly eaten by Jews in some parts of world during Chanukah, except they are made from shredded white radish instead of potato. 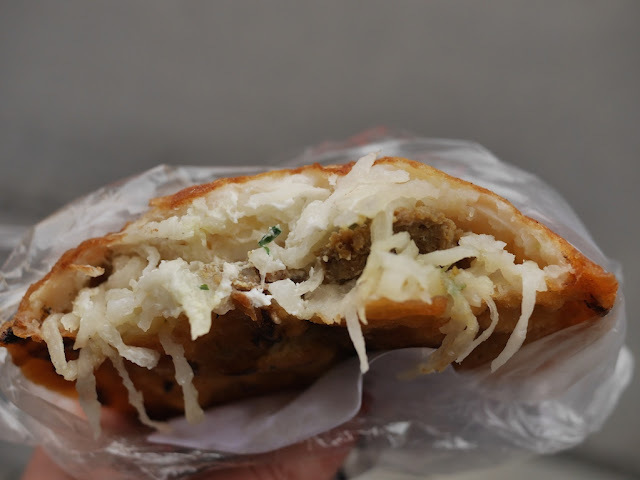 They are also stuffed, most often with meat and egg. The place I went to this day offered a variety of options. I figured I would avoid the common pork filling on this day. 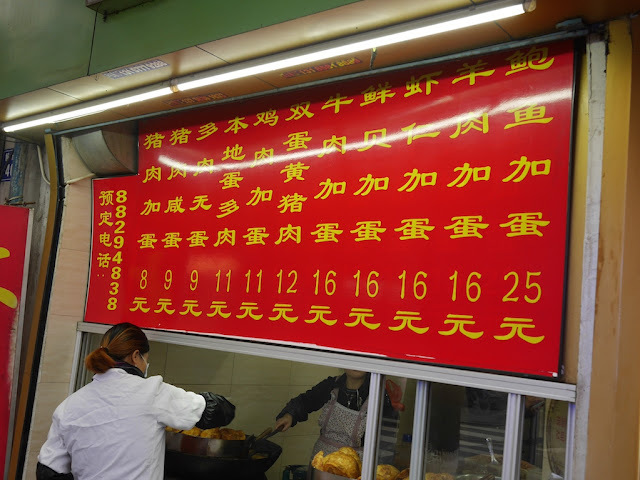 I asked whether the 羊 (yáng) listed on the menu meant lamb or goat. No answer came right away, but eventually someone said "It should be lamb." Good enough — either worked for me anyway. The radishy delight was tasty, although it left me craving applesauce. To top it off, the name of the latke-like treats has a coincidental tie to the Chanukah story, which traditionally includes the miracle of one day's worth of oil lasting for eight days. Due to their shape, they are called oil lamp cakes (灯盏糕). 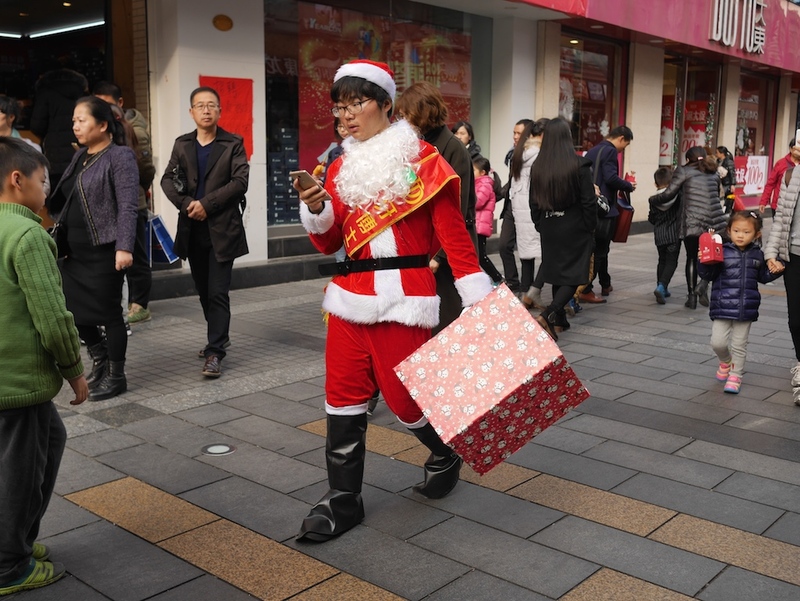 It will be hard for me to top this December 25th in China. Signs of the holiday were easy to spot the day before Christmas in Wenzhou, a city in Zhejiang on China's central east coast. 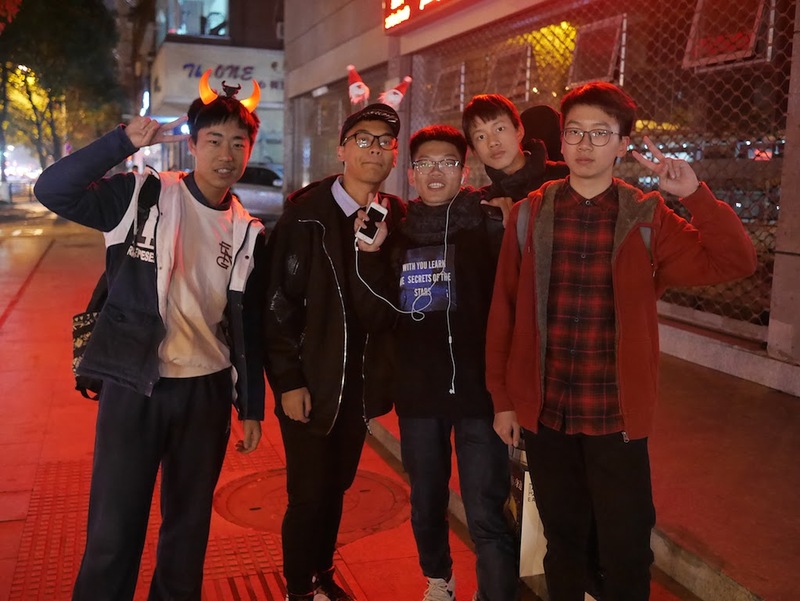 In many ways, they were similar to what I had seen previous years in Wuhan, in Changsha, in Putian, and in Zhangzhou. 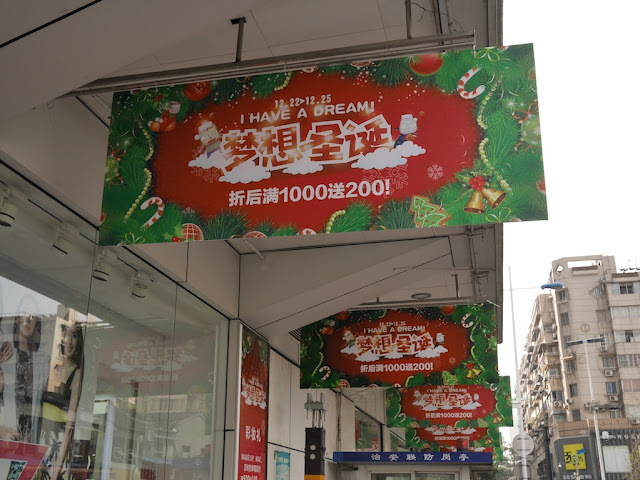 For example, in a central commercial district, there were numerous holiday promotions, including one with a "I have a dream!" theme at the Kaitai Department Store. And several stores I passed had people dressed up as skinny Santas. 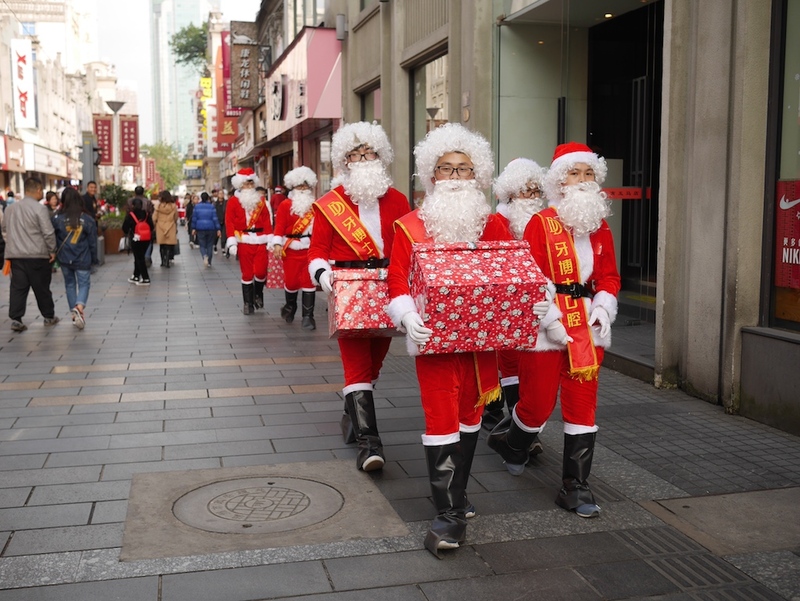 But I had never seen as many Santas together as I did at the Wuma Pedestrian Street. A parade of them kept coming . . .
And coming . 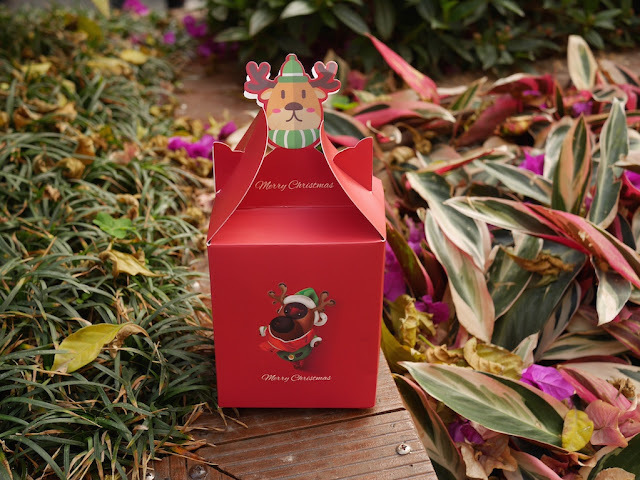 . .
One of the Santas handed me a gift. 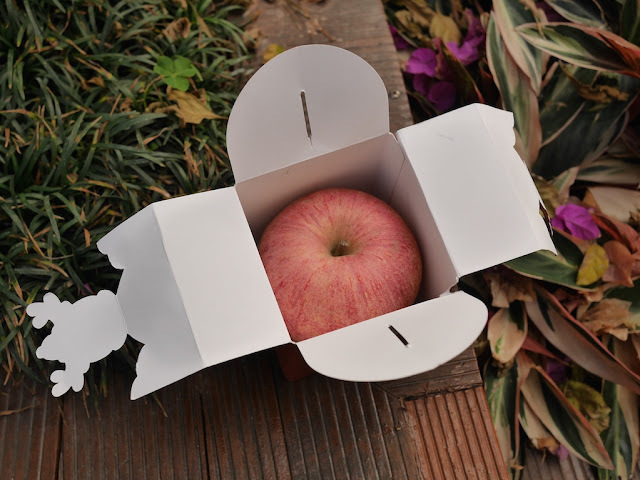 As soon as I had the box in my hand I realized it contained a Christmas apple — a tradition in China for Christmas Eve. 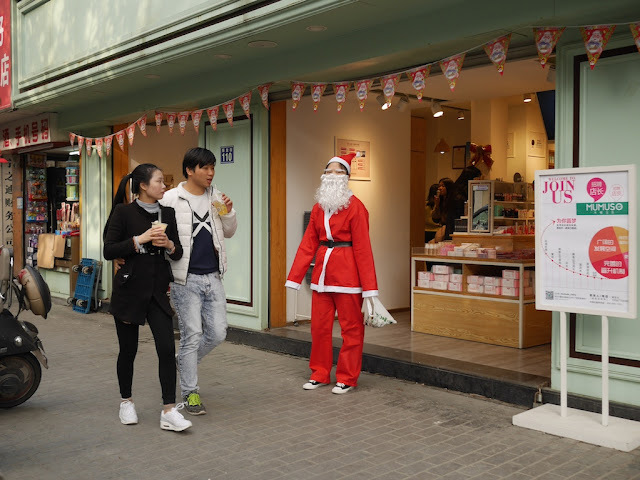 The Santas and their Christmas apples were part of a promotion for a dental clinic. I didn't get my teeth whitened, but the apple was good. 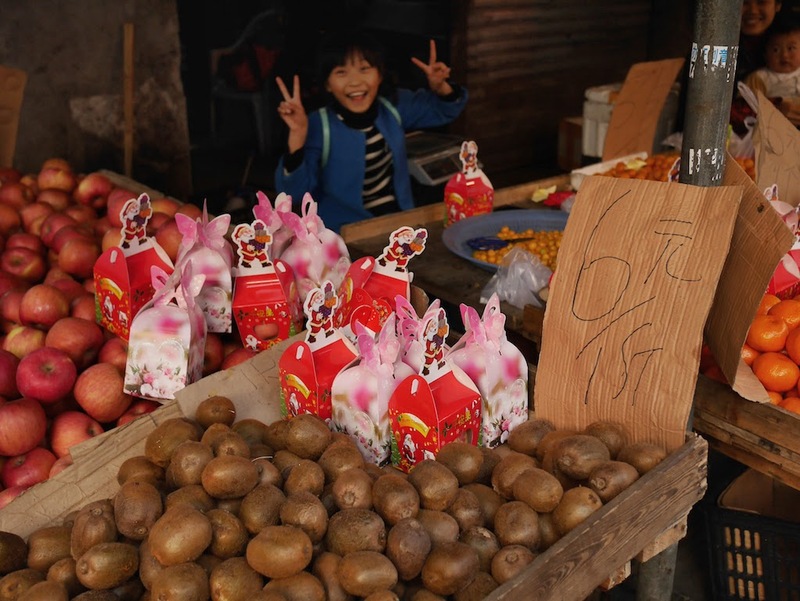 Christmas apples were for sale elsewhere, including at the Washi Lane wet market. 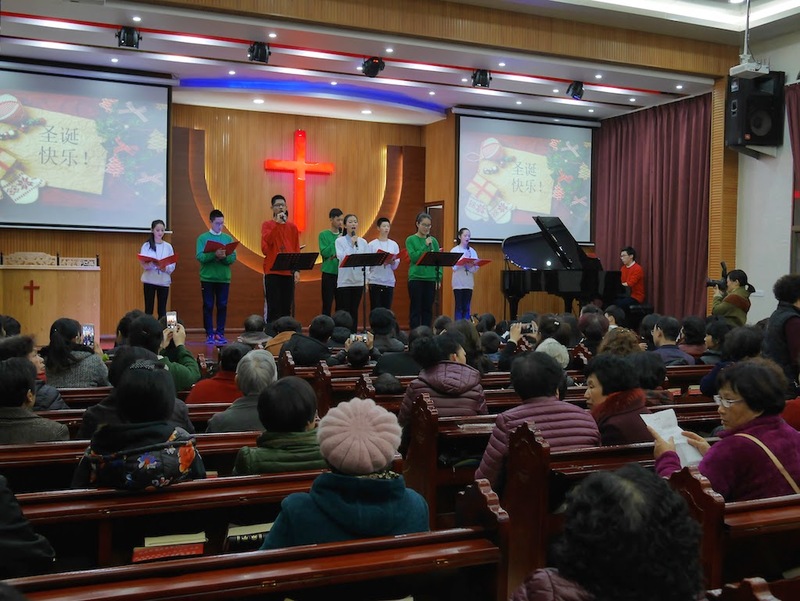 The Christmas holiday takes on a special significance in Wenzhou and elsewhere in Zhejiang due to recent forced demolitions of churches or removal of their crosses. I didn't seek out any churches, but I did stumble upon a small one on an alley off of Dasheng Lane. When I first passed by I noticed two men wearing unmarked uniforms standing nearby. Other people greeting guests encouraged me to come inside. They said photography was fine and pointed out the church's ceiling. There were approximately 150 people seated inside. I stuck around for a couple of songs. As I left, I noticed an unhappy-looking policeman talking to the greeters outside. I didn't stick around to listen. When I passed by the area later, the church was still active and a policeman was keeping an eye on things nearby. It was a far different scene from the 30+ police I saw at a larger church in Quanzhou four years ago. Not far away on Shuomen Old Street, the Hello K.T. bar had special Christmas all-you-can-drink deals. After not drinking all I could drink, I saw two people who were wearing a type of headgear I had seen a number of others wearing for the holiday. Yes, those are devil horns. No, I don't know how wearing them became a thing. My guess is their red color simply fits in. And lights. It is worth pointing out that for most people in China Christmas is mostly a chance to have some fun and there is no religious meaning attached. 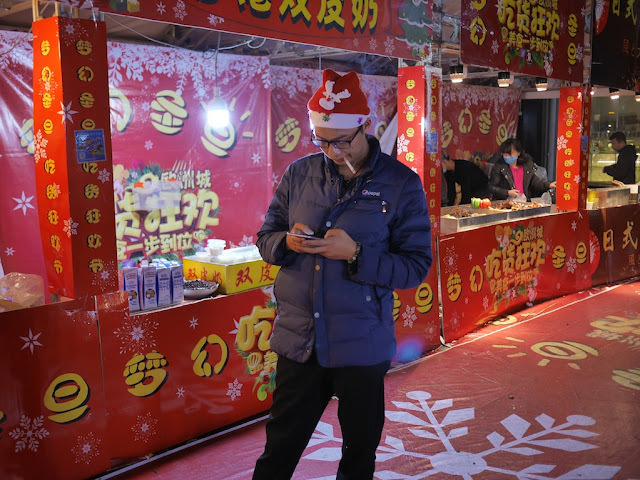 To top things off that day, I stopped by a food fair at Wenzhou's European City. A number of the booths were decorated for the holiday. 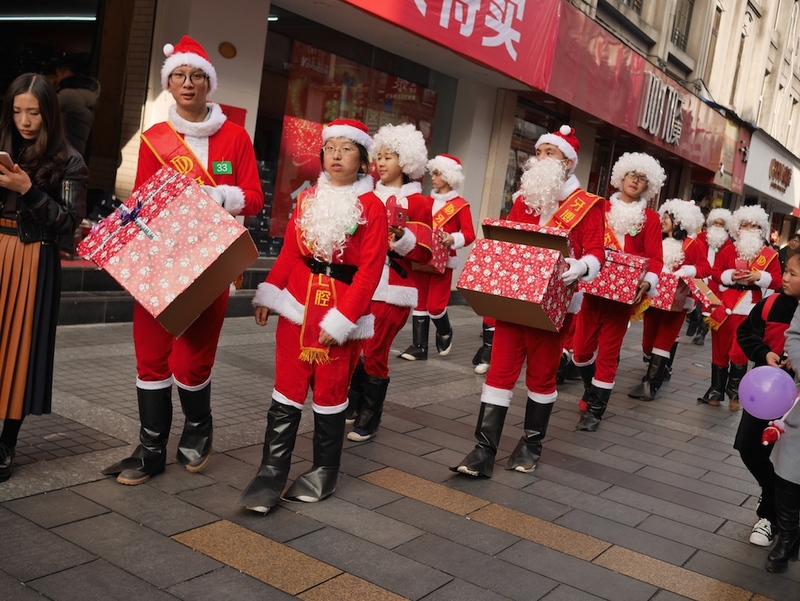 And a few people there were full of holiday spirit. 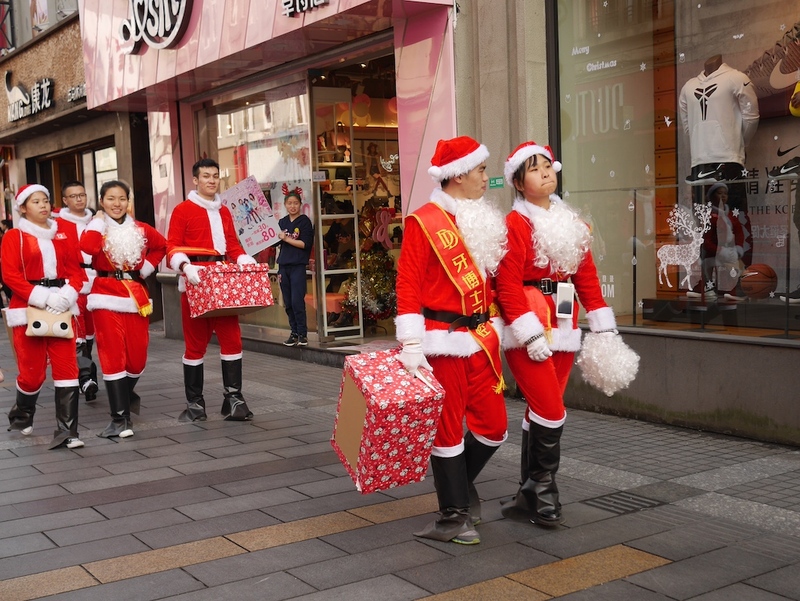 Most of the holiday spirit I saw on Christmas day was just more Santas and sales. But at the Wuma Pedestrian Street I saw my favorite Christmas holiday sight this year: two dressed-up children enthusiastically attacking their amused mother (I presume) with weapons made from balloons, a stick, and a giant inflatable pencil. They happily agreed to pose for an action photo. Maybe this will give rise to a new holiday tradition in China. On a Friday in Shanghai nearly two weeks ago, as I left Sichuan Road North Park I noticed a gathering of people alongside Hengshui Road. There were raised voices and, at times, multiple police cars. As I approached, I noticed a banner on an entrance to a construction site which indicated migrant workers were complaining the "ruthless company" hadn't paid them. 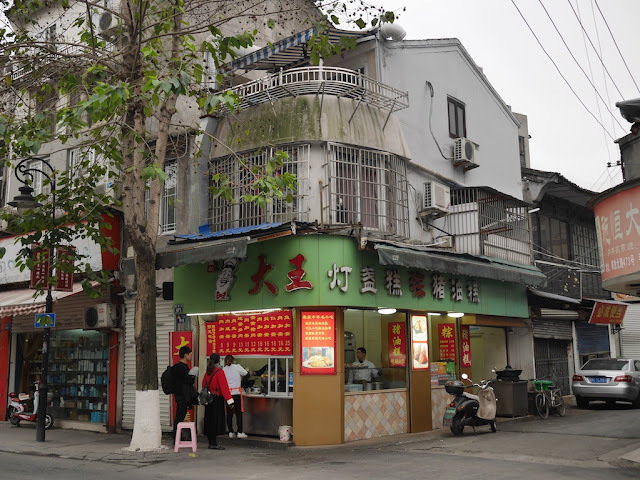 Numerous disputes like this occur all over China, but it is not something I often come across unexpectedly. After observing for a few minutes, somebody in the crowd yelled "look, a foreigner is taking photos!" Based on the tone of voice, I assumed the person wanted to implicitly use my presence as a point of leverage: you are embarrassing yourselves or China. Whatever the case, I wasn't sure where this might lead, and I decided it was a grand time to move on. I was rather hungry anyway. When I passed by two hours later, the crowd was gone but not the banner or the two wreaths of flowers commonly used for funerals in China. My guess is the police helped to broker an agreement that the workers would end their public gathering if the company agreed to leave up the display. Perhaps other concessions were made as well. Perhaps the situation will be resolved. 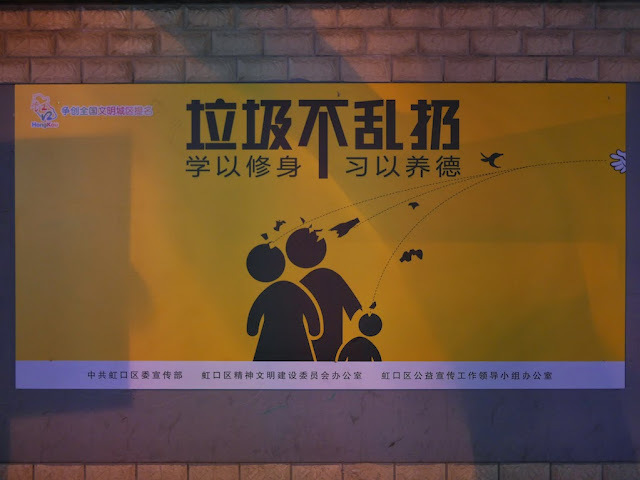 A sign depicting possible trash projectiles in Hongkou, Shanghai, singularly focuses on a "don't litter" message. But that is not enough for a sign at the Simingli Leisure Plaza in Huangpu, Shanghai. It adds six more "don'ts. A government-issued publication, How to Be a Lovely Shanghainese lacked the charm of Hartley's Gentlemen's Book of Etiquette. 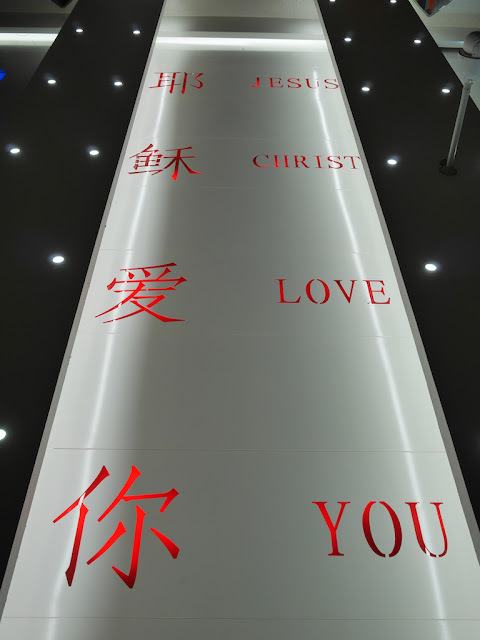 Its chapters were sprinkled with laundry lists of behavior modification, steeped in the Chinese obsession with numerology: "Five kinds of consciousness," "four kinds of spirit," "five dares," and "four forevers." 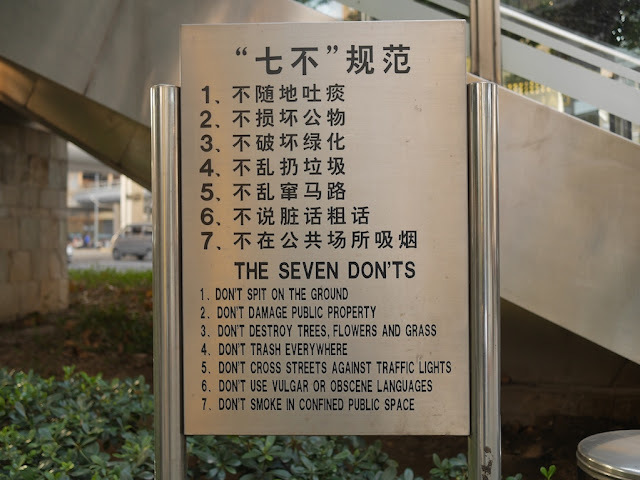 There were also the Seven Don'ts: "Don't spit; don't litter; don't damage public property; don't damage greenery; don't jaywalk; don't smoke in public areas; don't utter vulgar words." 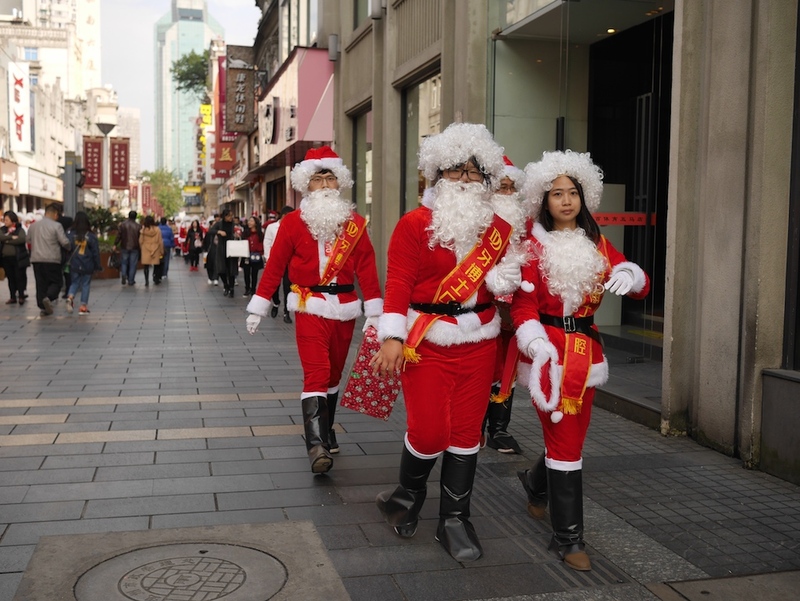 Still, Shanghai's government failed to realize its ambitious goals by the time the world's fair came around [in 2010]. Public property remained largely undamaged, but other than that lone abided restriction, I commonly saw locals do these don'ts within minutes of walking down the Street of Eternal Happiness. 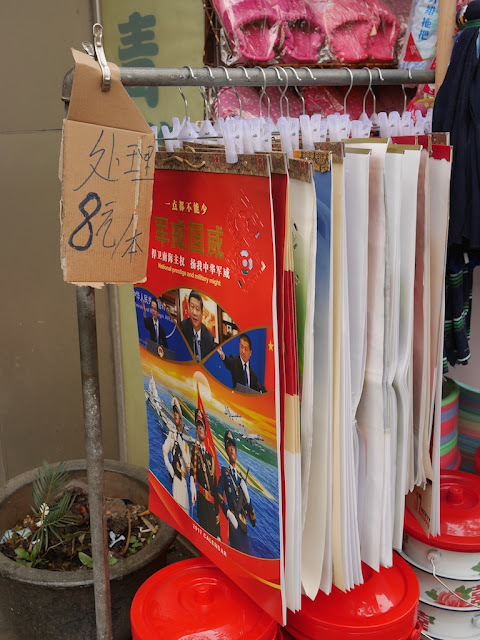 The Shanghai government first promoted the Seven Don'ts in 1995 and earlier this year sought feedback for an updated list (link in Chinese). 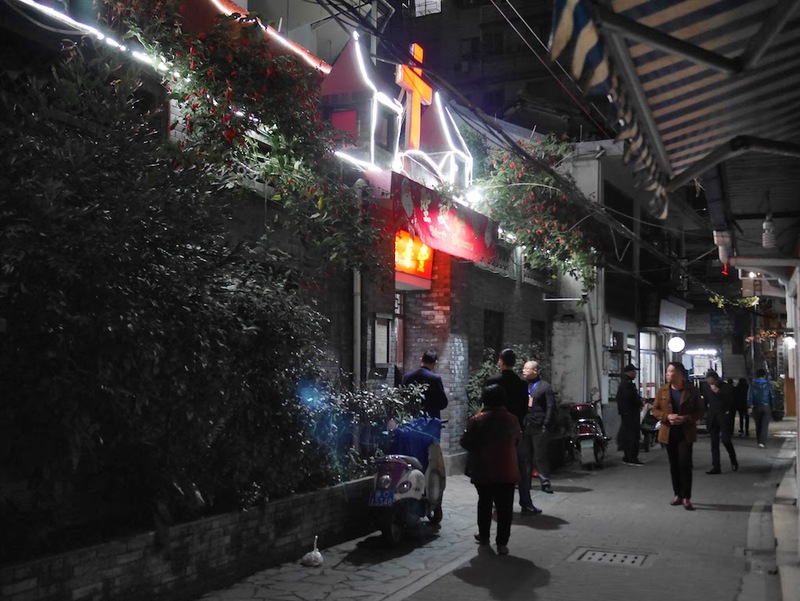 The resulting new Seven Don'ts list (link in Chinese) includes a couple of old favorites but also reflects some of the change Shanghai has experienced over the past 20 years. I haven't found any official English translations, so I will share my own interpretations along with some brief commentary. 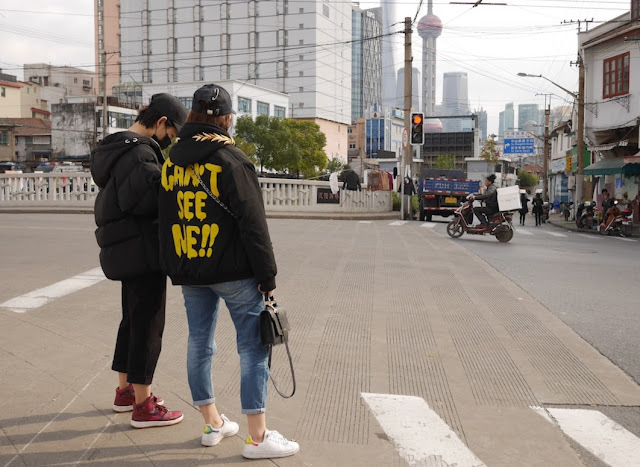 Jaywalking is common in Shanghai, but it is notable what isn't mentioned: the drivers of vehicles, particularly smaller types, who regularly ignore traffic signals (or non-jaywalking pedestrians), perhaps to a greater degree. 2. Don't park or stop vehicles indiscriminately. 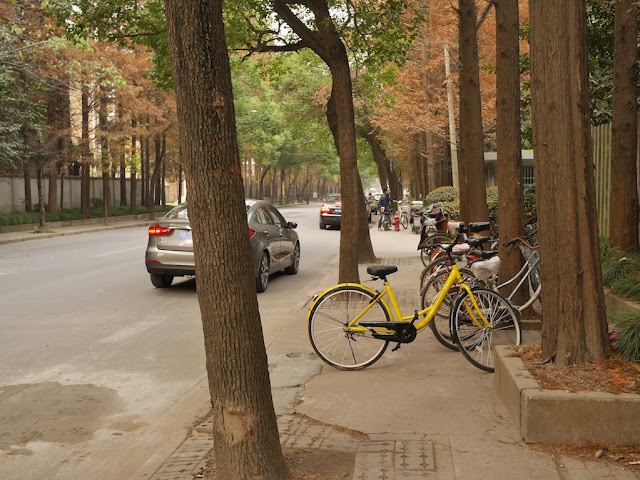 I will place the bicycle which recently caused me to walk into wet concrete in this category. I am reminded of the many other times I have seen people stop / park a vehicle in a manner which impedes other vehicles or pedestrians, even when ample out-of-the-way space exists. 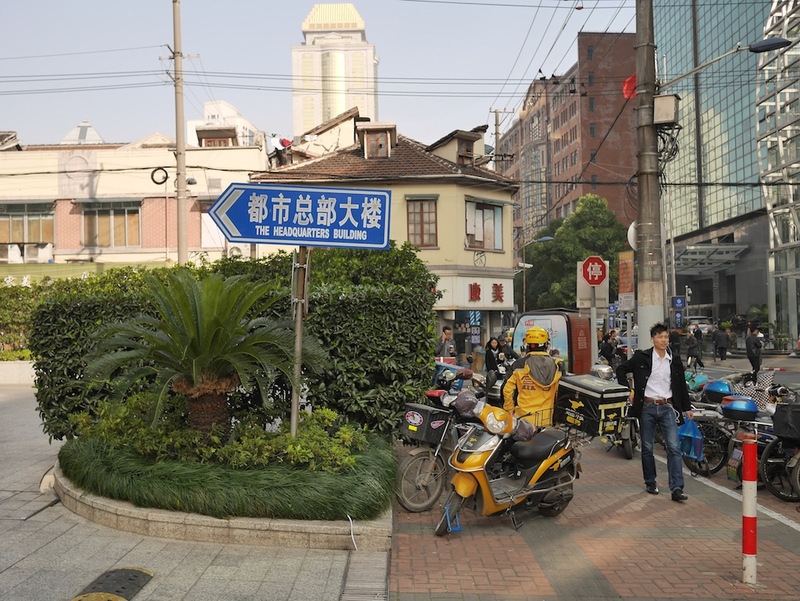 This is an area where I have seen a lot of change over the past 10 years in Shanghai. There seems to be much less litter these days. Shanghai isn't satisfied though. 4. Don't let pets disturb neighbors. This added rule presumably results in large part from the increase in dog ownership in China. I am now tempted to explain why I don't think cleaning off your plate means you didn't waste food. This isn't meant as commentary specific to Shanghai or China, and I will save it for another day. 6. Don't create a disturbance when speaking. One image accompanying this rule in an earlier shared link depicts a man speaking loudly on his mobile phone while sitting next to others in a waiting room. Rules can have an impact, but China's likely growing problem with hearing-related disabilities may make it only more likely there will be people speaking loudly. 7. Don't cut in line. The rule seems to assume there's a clear line in the first place, which isn't always the case. But this is another area where I have seen a lot of change in China. People are now more likely to stand in a line and not cut, though sometimes that can be due to structures which make it difficult to do otherwise. Still, examples of people cutting are easy to see. There is much, much more I could say about each of these don'ts — material for some future posts. 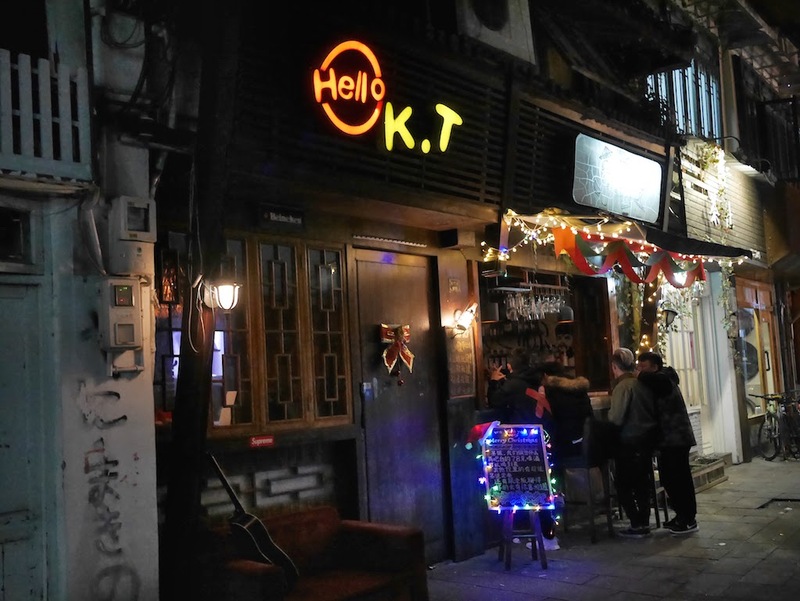 It would be fascinating to hear opinions about this new set of rules and suggestions for other rules from a representative slice of Shanghai's people. Undoubtedly, many have their own ideas about what behaviors they would most like to see changed. The text expresses a "do not litter" message. When I first looked at the sign, I thought the people had lost chunks of their heads due to thrown debris, including a broken bottle — a rather intense way to communicate the message. But I now suspect the notches in the heads represent open mouths on all of the people and a few additional details for one. In that case, the open mouths could indicate the people were appalled by the littering. And maybe none of the debris is headed directly at them. If this is the only intended interpretation, some additional visual cues would be useful. Whatever the case, the sign got my attention. 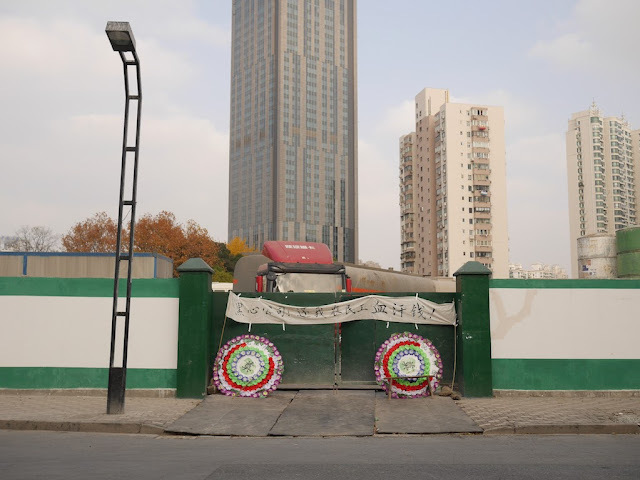 As mentioned in a post with photos of a woman selling flowers from a cart, last Friday I briefly wondered about the history of the Hongkou Fire Station in Shanghai. Although the Hongkou district boasts a variety of architecture, the building stands out there as it would in many other places. Not long after taking a few photos of the station on Friday, I discovered that Paul French, author of a number of books about China including The Old Shanghai A-Z, had coincidentally written a post about the building just two days earlier. Sadly, the news he shared was not great. 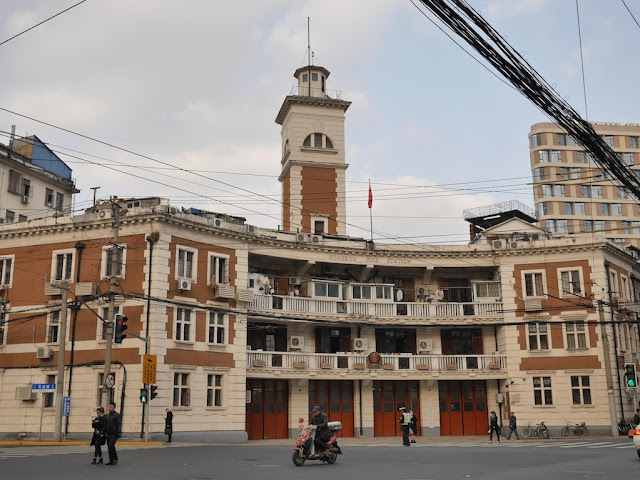 "Will They Really Destroy Hongkou Fire Station?" includes a bit about the fire station's history and explains why French worries the building completed in 1932 won't be around for much longer. During a tour I gave in Hongkou to a relative, I pointed out a few areas which have been recently demolished. It would be a shame if this building gets added to the list. Later, I will post about a recently demolished neighborhood in walking distance from the fire station. When I went there last year I saw some of its remaining life. 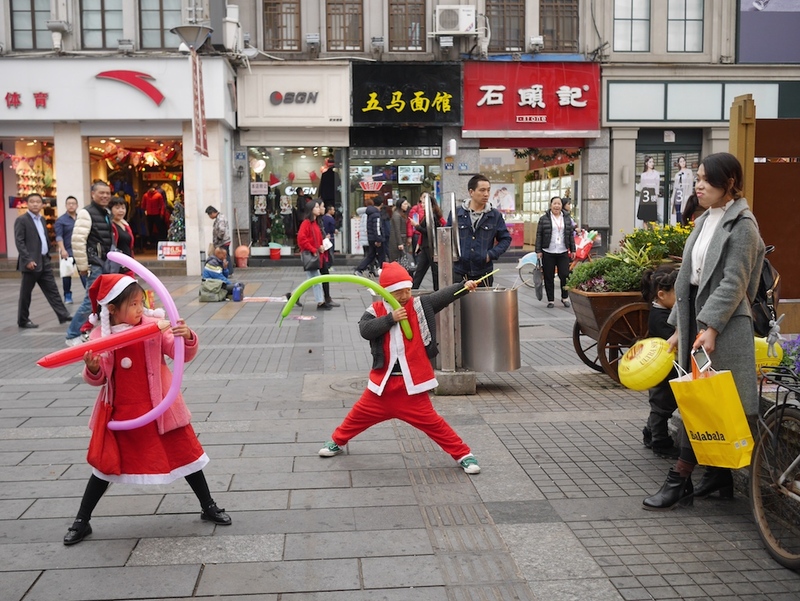 This year, the most lively thing I saw was a demonstration. 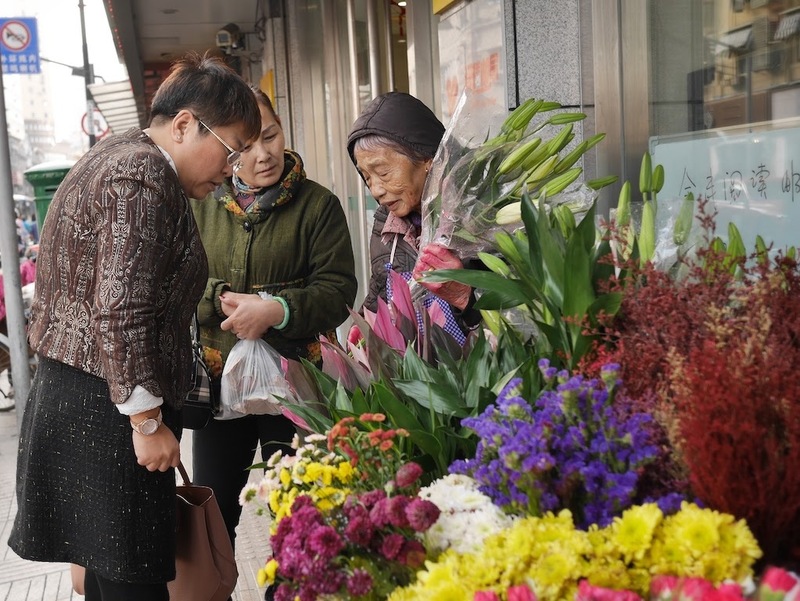 This weekend I didn't see another woman selling flowers from a push cart in Hongkou, Shanghai. 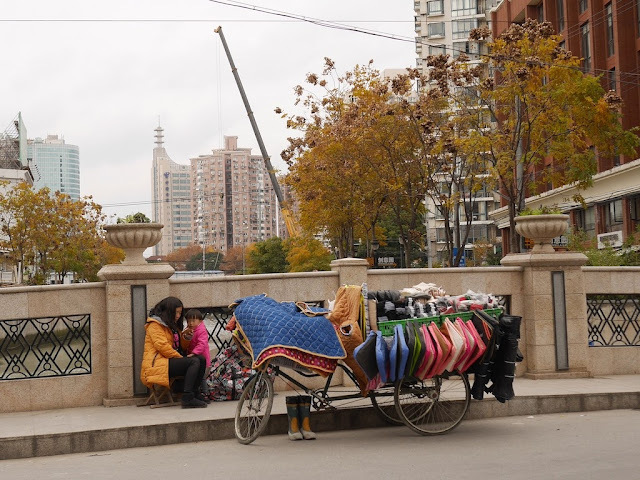 But on a small bridge on Ha'erbin Road, I did see a woman selling assorted items from a tricycle cart. She was mostly preoccupied with her mobile phone at the time. The child with her looked on and also watched some of the people and vehicles passing by. 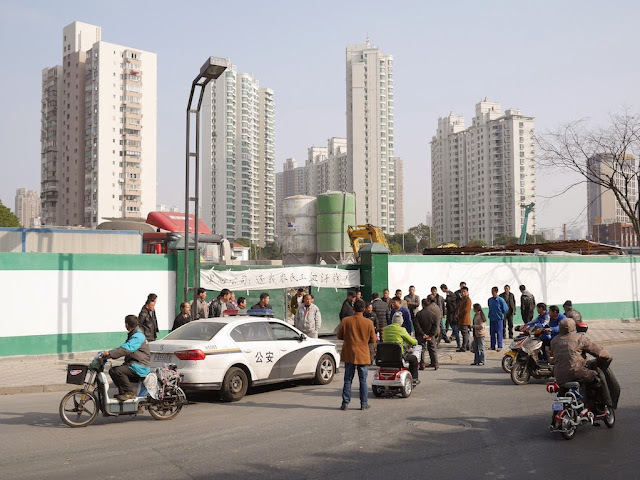 Among other things I did today in Hongkou, Shanghai, I saw migrant workers outside a construction site demonstrate about missing pay, remembered the partially demolished neighborhood I had walked through there over a year ago, listened to a security guard for an art museum criticize Donald Trump, ate traditional plum flower cake with a black sesame filling, drank milk tea which had no taste of tea, and wondered about the history of the Hongkou Fire Station. Watching a woman sell flowers from a cart alongside Sichuan North Road was something else I did. All I have mentioned would be suitable for a post, and I hope to share more about each of them someday in the future. But as I looked through today's photos, sharing some of the woman and her flowers felt most fitting for this Friday. The scenes make even more of an impression now than when I took the photos, perhaps because I have more time to reflect upon them. Or maybe because they now feel more isolated from the busy environment which surrounded them. So here are two photos of a person I saw only briefly. 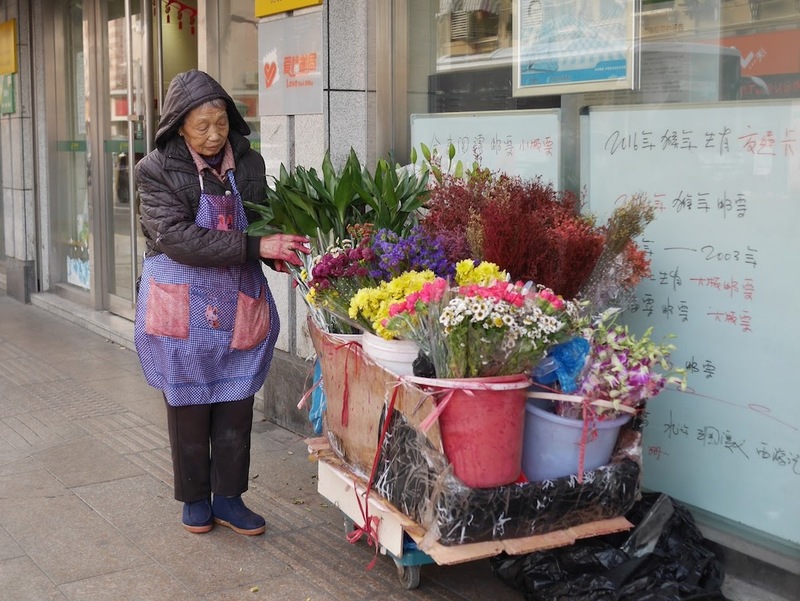 Before I left the area, I saw her rolling her cart of flowers away. I didn't know why she had decided it was time to move on, and I didn't know where she was going. During a recent visit to Fuxing Island in Shanghai, a bike blocked my intended path. 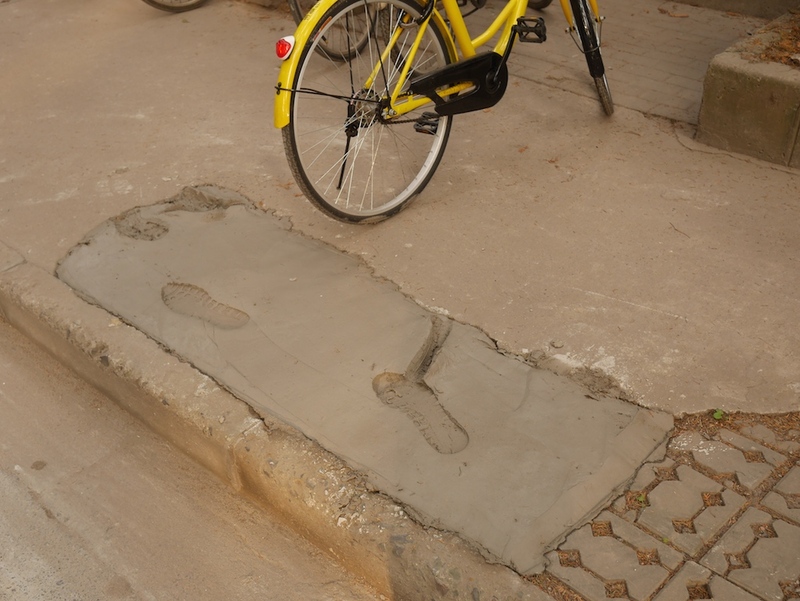 Similar obstructions are common on sidewalks in much of China, so I didn't spend much time thinking about it. I wouldn't even need to leave the sidewalk. Although I was able to adjust my path without much problem, I suddenly had a sinking feeling. In two more steps I found myself on firmer ground and confirmed my hypothesis: I had walked in wet concrete. 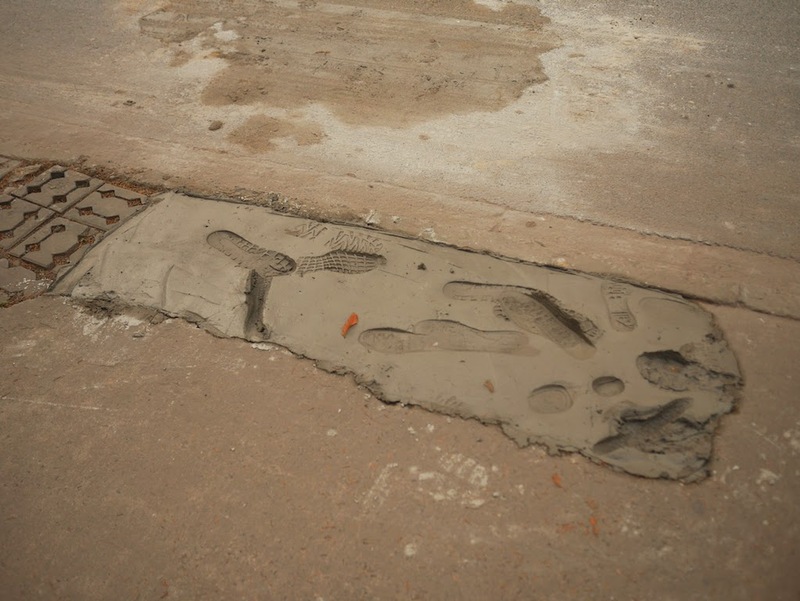 I have accidentally left similar marks in China on multiple occasions, such as my previous wet concrete incident earlier this year in Jieyang, Guangdong. So I am somewhat experienced in this area. My shoes were OK, and such is life. Not long after my latest immersive experience, a woman approached on a path similar to my earlier one. Initially, she appeared to be confused as to why I so strongly encouraged her to stop, which she did just in time. But after looking for a few seconds at where I pointed, she smiled and walked around the patched area of the sidewalk. I soon headed onward myself after finishing taking a few photos of my latest contribution to China's concrete. An hour later I passed by again and saw others had joined the collaborative project. The unmarked area of wet concrete fits a theme of more open construction spaces I have come across numerous times in Shanghai and many other cities in China, such as in Shangqiu and in Qingdao. But when I later looked at the photos I had taken, one caused me to wonder about a type of question I don't usually feel compelled to consider in these cases. 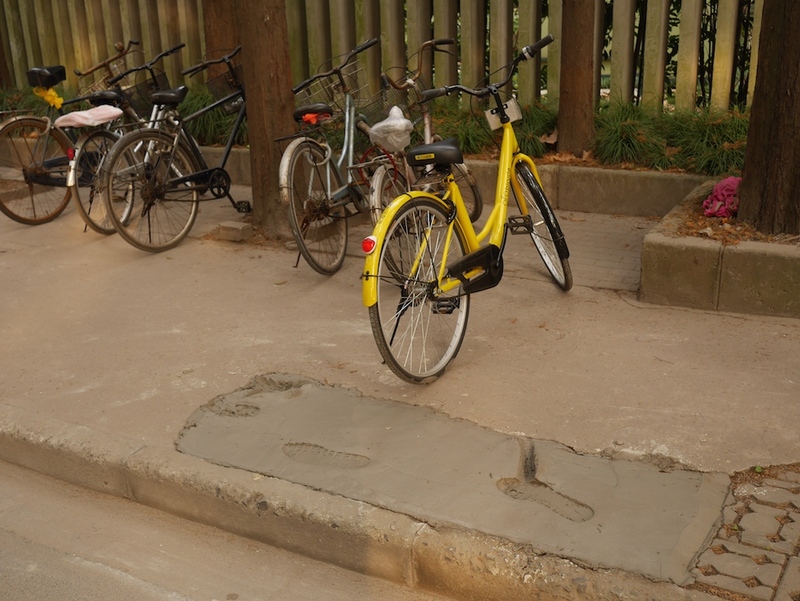 Had the bike been deliberately placed in its location to increase the chance of people walking into the wet concrete? It was very well located in this regard, and a more out-of-the-way space in an area used by other bikes was open immediately in front of it. I don't doubt there are people who for one reason or another, perhaps even for art's sake, would do something like this. But it also seems plausible somebody parked the bike in its location without considering the potential impact, and perhaps the space was occupied before. 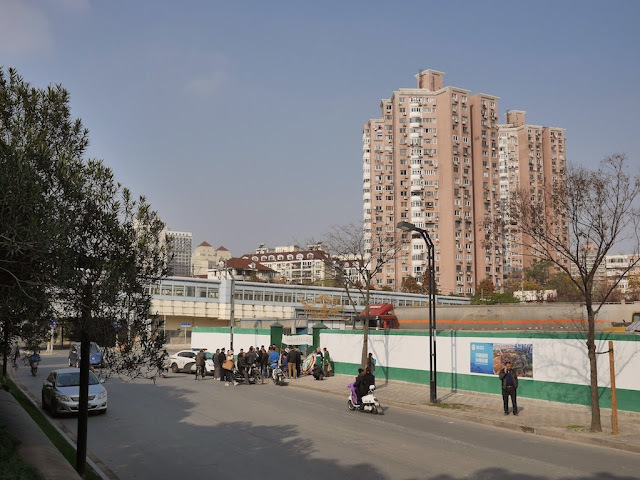 A question which I probably have a better chance of answering is whether the marks left by me and others will remain for a long period of time or, as when my footprint in the Jieyang concrete patch was removed, they will be short lived. I don't have plans to return to this location any time soon, if ever. So if any readers happen to be in the area someday, an update on the condition of this patched portion of sidewalk just south of Fuxing Island Park's western entrance would be most appreciated. 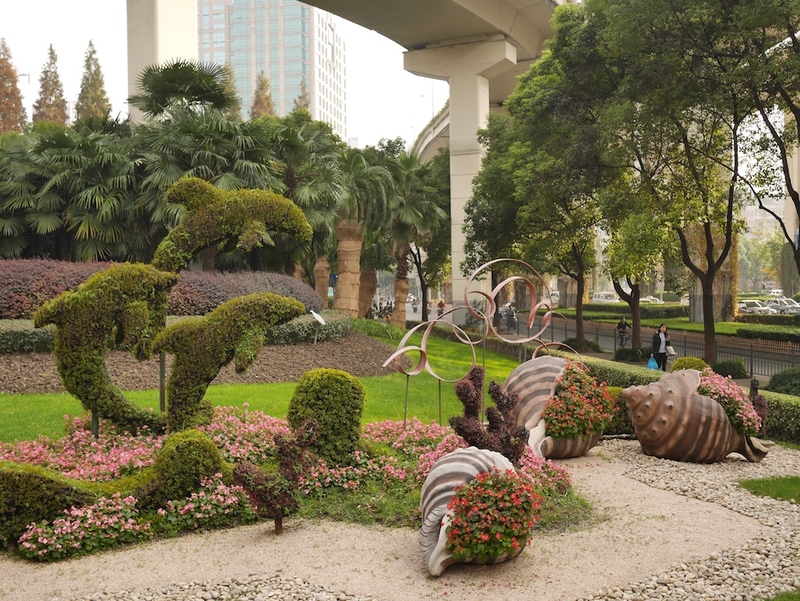 In yesterday's post about some giant shells I saw in Shanghai, I wrote "Unless I see a large snail sculpture tomorrow this probably concludes the recent series of creativity involving giant versions of things." You can probably already see where this is going, so I will just share the relevant photo I took today. As I approached a small green area next to Yanshupu Road in Hongkou, Shanghai, I wondered if I was looking at bushes deliberately cut into the shape of a giant snail. On closer inspection, I discovered the apparent neck and head were one plant and the shell another. They only appeared to be possibly connected from a particular viewing angle and were separated by other vegetation. I doubt my initial impression of a snail was intended. Since I am back on this topic . 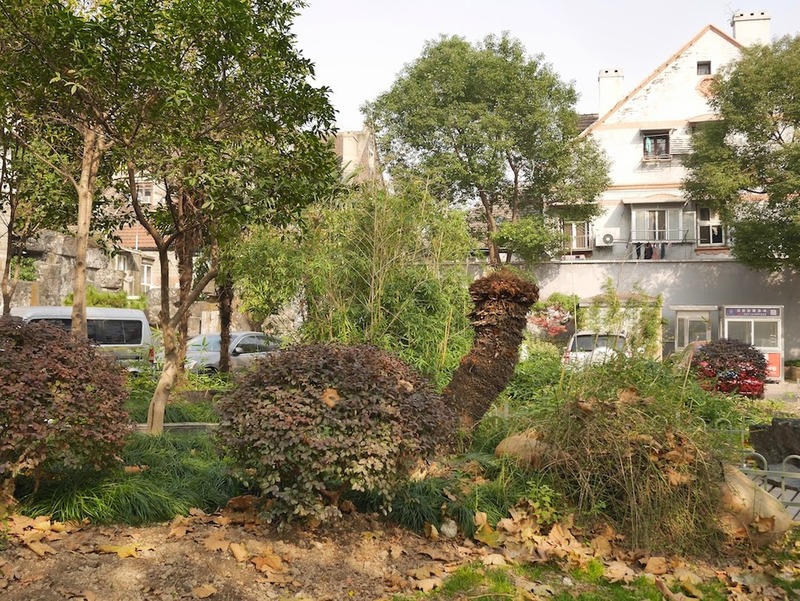 . .
Not far from the snail, in a community off of Huimin Road I saw what could be mistaken for a large, but not huge, sculpture of a panda. 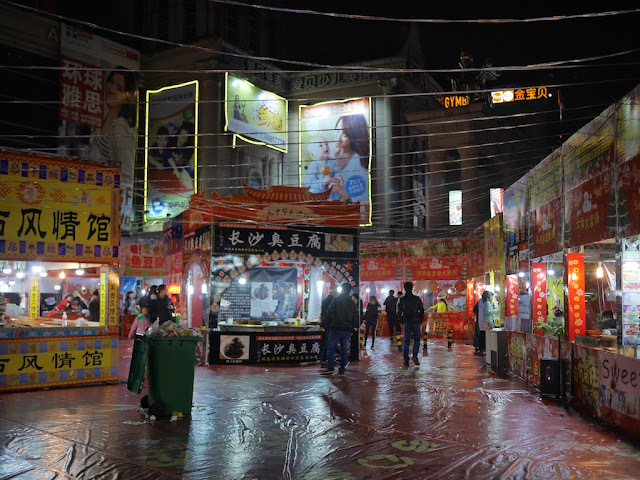 The panda is one of many which can be found in Shanghai, and they have a purpose beyond any sort of artistic expression. 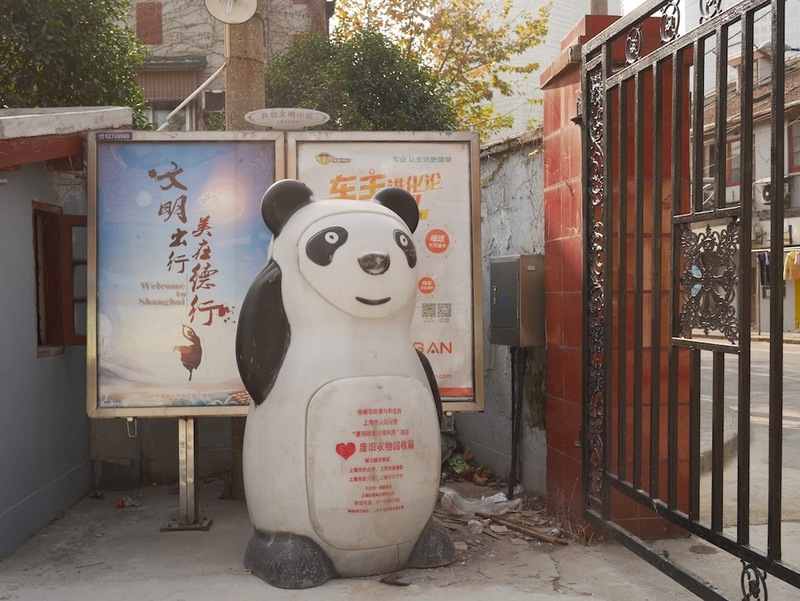 The pandas serve as bins for donating used clothes — just push in the panda's face and drop them in. According to an article in Shanghai Daily about technology included in newer panda bins to facilitate the collection process, a small percentage of the clothes are donated while the rest are recycled into products such as jeans and vegetable protection nets. However, some of the clothes are stolen out of the bins and end up elsewhere. I have no other sightings of large versions of things to report from today. And I am confident I will be moving onto another topic next, though it too will relate to earlier posts. I will say something about my immersive experience with wet cement, yet again, later. 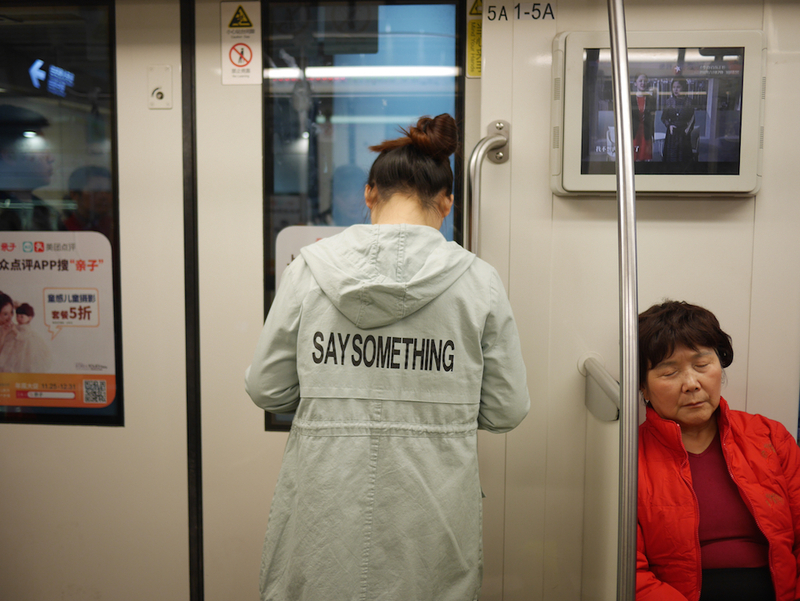 A recent ride on the Shanghai metro reminded me it would be a good time to write and post more. After sharing photos of a giant ding and a a large shell-themed building in Dalian, I considered sharing a photo of shells. Unfortunately (or fortunately for shell-haters) I didn't have anything like that from Dalian. So, instead of shells, I shared a photo of a sculpture with large fish in Dalian. I wasn't planning to continue the series further right now. But then, after lunch yesterday, I stumbled upon something miraculously perfect. I am pretty sure the giant shells aren't real. Based on the flora, some readers would likely also guess they aren't in Dalian. And indeed this scene is farther south. More specifically, the shells rest on the corner of a park at the intersection of Chongqing Road and Yan'an Road in Shanghai. Unless I see a large snail sculpture tomorrow, this probably concludes the recent series of creativity involving giant versions of things. 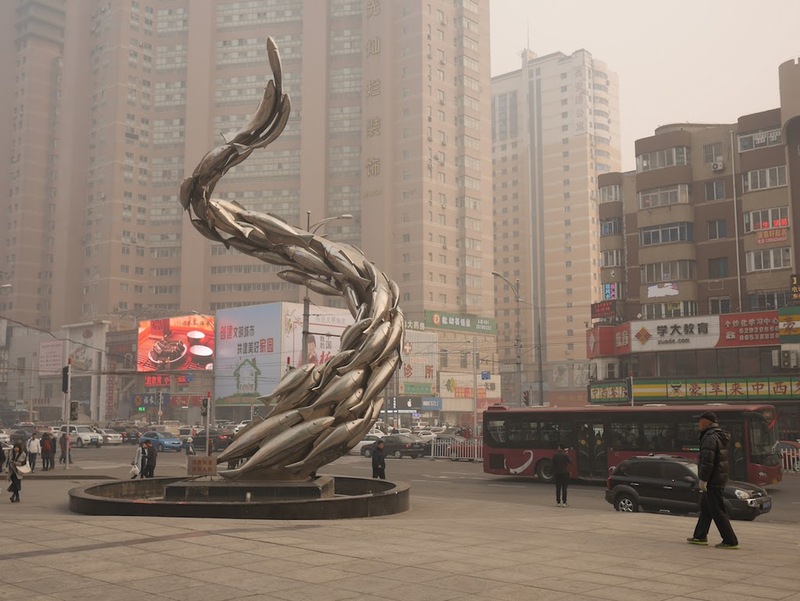 Instead of a large ding or large shells, a twisting sculpture in front of the Mykal department store at the intersection of Xi'an Road and Huanghe Road in Shahekou, Dalian, incorporates large fish. Whether you want to credit smog, fog, or both, you could say the water was murky that day. While walking around Xinghai Square in Dalian, I wondered about the purpose of one especially unusual building nearby. When I approached I found the fitting answer. 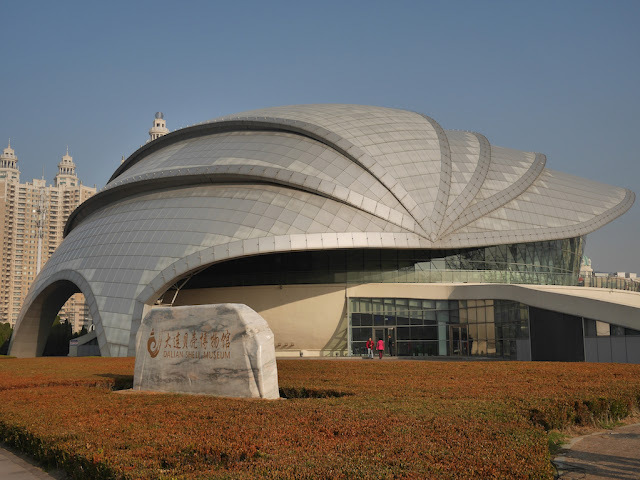 It would be fitting to now share my impressions of the Dalian Shell Museum's collection, but when I was nearby I decided to spend my time on non-shell activities. Nonetheless, I was glad I took a closer look at some of the building's architectural features, designed by the Design Institute of Civil Engineering & Architecture at the Dalian University of Technology.